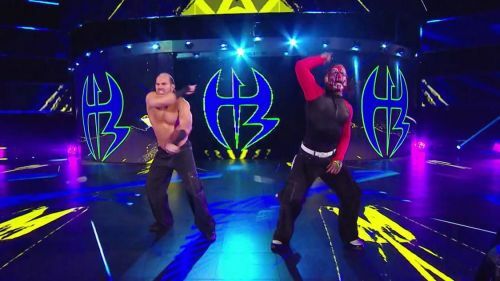 Matt Hardy made his surprise return to in-ring competition last week on SmackDown Live when he reunited with his brother, Jeff Hardy, to re-form The Hardy Boyz. They even emerged victorious in their tag team match and this week, we saw them defend the team of Aleister Black and Ricochet from the attacks of the heel tag teams of SmackDown Live. Shockingly, none of these four teams are in the SmackDown tag team title picture, and if we look at the tag teams on the blue brand, they are too many to fit in the 2-hour show. Apart from the reigning tag team champions The Usos, there is the team of Shane McMahon and The Miz, The Colons, The Good Brothers, Sanity, The New Day, plus these 4 teams on SmackDown's roster. Also the NXT tag teams feature on both the shows, making it difficult for the WWE Creative to utilize the tag team roster to its maximum. Whereas, on the 3-hour show, Monday Night RAW, we have very few relevant tag teams. The fact that the newly called up tag team of Ricochet and Aleister Black is battling for the RAW tag team titles after just 3 weeks of their debut solidifies the above statement. WWE should consider strengthening the tag team division of the red brand, which has been lacklustre ever since WrestleMania 34. It has been nearly an year now that the red brand has not had a relevant tag team at the helm. The Revival won the titles a few weeks ago, but their title reign has been dull thus far. If The Hardy Boyz move to RAW, then the stale tag team division can get a new life. The Hardy Boyz are the legends of the tag team division and have the talent to rebuild the division. On SmackDown Live, the WWE Creative may overlook them, and a singles feud for either of the Hardy brothers seems unlikely at the moment. Thus, it would be great if The Hardy Boyz move to RAW as soon as possible. Do you agree that this legendary tag team should move to the 'A' show? Share your views in the comments box below.